The Municipal sales representative, Steve Gutowski, met up with “The Gunny” — “Drop and give me 20” U.S. Marine Corp. Drill Instructor R. Lee “Gunny” Ermey (Ret.) at the IACP. 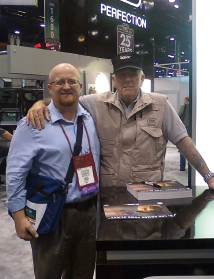 Ermey, representing Glock, is also known for portraying drill sergeants in the film industry.